Ascending triangle pattern on currency pair chart has a flat top and a rising lower line. Rising lower line shows that the pair getting support at upper and upper price level. To draw a ascending triangle pattern we must have two highs and two lows. The flat top represents the resistance levels. When the chart break out the flat top the currency can be bought. 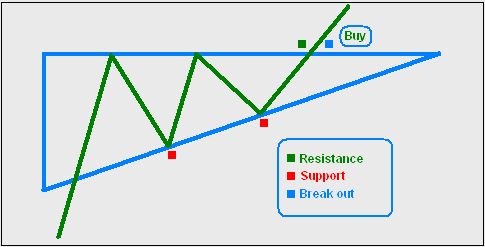 The break out indicates that the buy pressure in the market has forced the pair to break the resistance level. 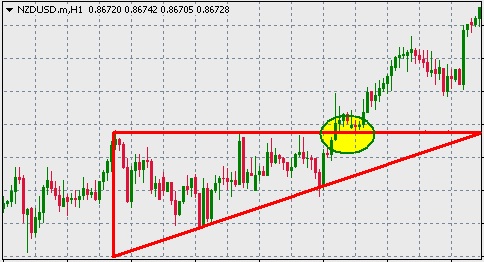 Above image shows how ascending triangle chart pattern drawn on the chart of NZD/USD currency pair.While buying with the ascending triangle chart pattern, the stop loss can be put at the previous support point or at the rising lower line.Ascending triangle chart pattern can be drawn on charts in different time frames.